MLMV HD – A Game of Romantic Courtship! 5 Best Love-Quotes – but nothing sums up the bliss of being in Love. I have a feeling that Mark Twain must’ve said this (or written it) in a moment of amazing lucidity. It begins funny, and makes you wonder what Ms. Griffith could be driving at. I guess this was her motive, but then what she said makes perfect sense. Yes, and love is best among those beautiful things. 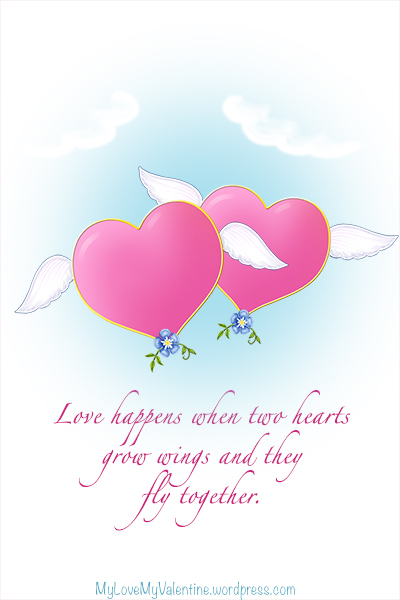 A Valentine’s Day Message for him or her – When two hearts fly together! Bullet for My Valentine and… Valentine’s Day. Really? Question: So why “Bullet for My Valentine” call themselves by this mysterious name? Answer: This Heavy Metal band, which was formed in 1998, released its first album”The Poison,” in the US on February 14th 2006. One of the musicians (Mathew Tuck, Michael Thomas, Michael Paget, and Jason James) had suffered from a broken heart, right before they launched their first album on Valentine’s day. I’ve no idea whether any of their songs have anything to do with Valentine’s Day, but I’ve realized that some of the lyrics of their songs have a strong dark streak. You can also read more about them here. Valentine’s Day – 5 Sweet and Original Gift Ideas for Her. If you are wondering how you can make an indeliable impression on the girl of your dreams, here are 5 original ideas to set her heart aflutter. Buy a romantic book. Browse through its pages. Find the most romantic statements and underline them. You can also add your own feelings on random pages. Wrap it in a Valentine’s Day wrapping paper, and write on the cover, “for your eyes only.” Gift her the book. You’ll know when she has read it. If you are young, seriously in love, and you can’t afford to gift her jewelry; gift her a jewelry box instead. Write a sincere love-note and tell her that one day you hope to fill it for her. Write 7 love-notes to her, but not on paper. Instead, discover unconventional things to write them on. For instance, a piece of bark, a paper-napkin, chocolate-wrapper, a lace handkerchief, and so on. Surprise her; let her know that you think of her all the time. 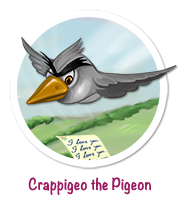 Oh, and don’t send those love-notes to her all at once, send them one day at a time. A good time to begin would be February 8. 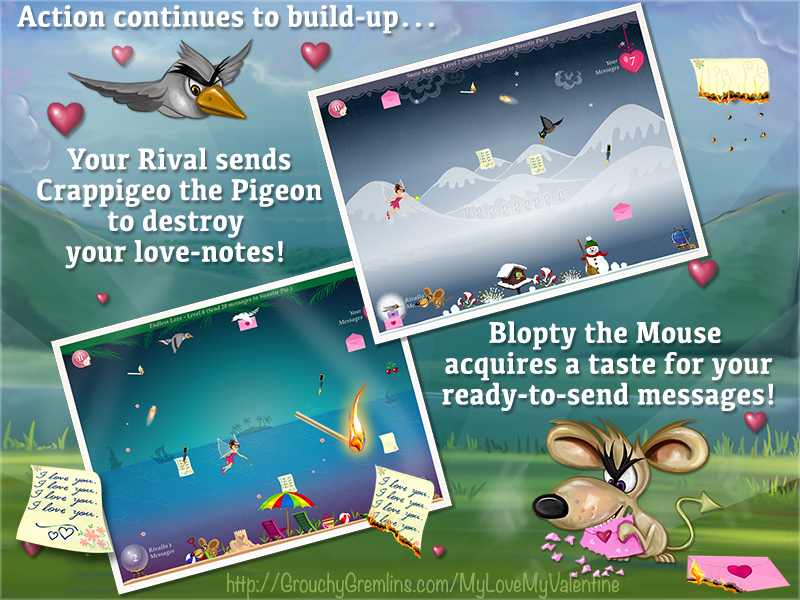 My Love My Valentine – A Unique Game of Romance and Rivalry – A Valentine’s Day Gift for your Sweetheart. 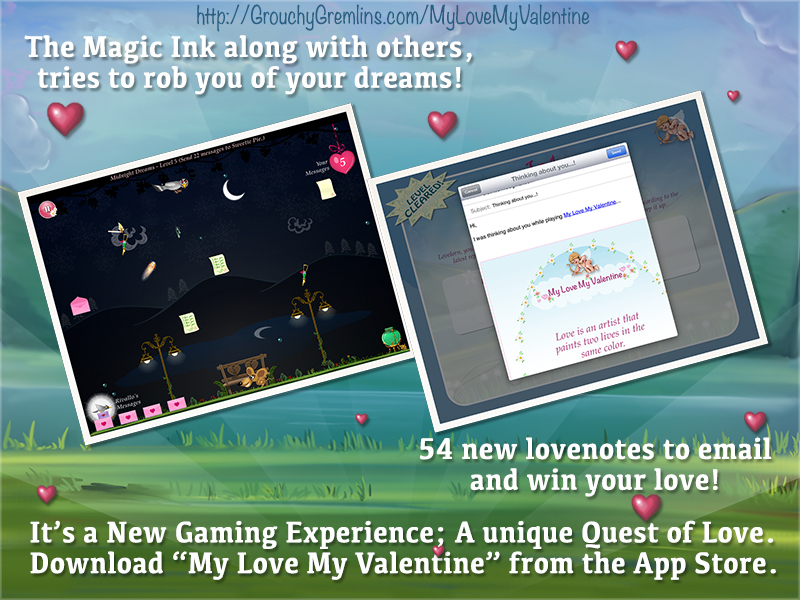 My Love My Valentine is a new gaming experience and a unique quest for love! 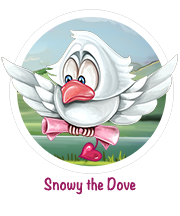 In this 54-level iPad Game My Love My Valentine, you woo your sweetheart by sending love messages to him or her through your trusty dove, Snowy. However, as it often happens in life, in this game too you have a rival-in-love. This is why you are not the only one sending messages to your sweetheart. But your rival believes that everything is fair in love and war, and so tries different underhand tactics to slow you down. Your rival tossing those burning matchsticks to destroy your writing material, is just a beginning. As you move through the 54 levels of this game, your rival also sends love-assassins stop you from winning your love. the magic ink, which keeps vanishing from your love-notes! The action continues to build-up with every successive level as your rival and the love-assassins become smarter, faster, and stronger. 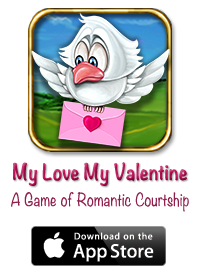 My Love My Valentine – A Game of Romantic Courtship for iPad available on the App Store! Wooing your sweetheart isn’t easy with these love-assassins running lose. Voracio the crow doesn’t give up and the whizzing fireballs don’t discriminate! Be careful. Don’t get addicted! Deal with the crow and the whizzing fireballs, while your rival competes with you for your sweetheart’s loving gaze. 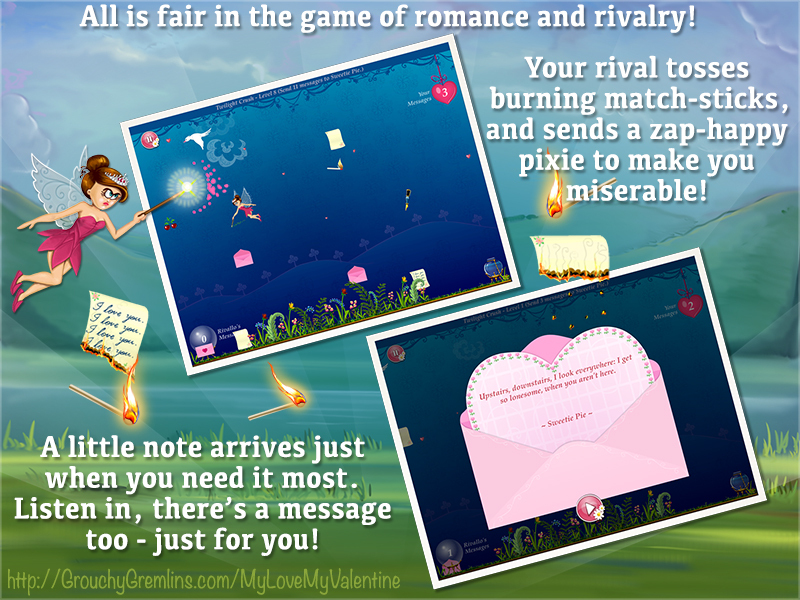 Envy gives way to enthusiasm as you battle for your love through 54 exciting levels, sending 54 different love messages to your sweetheart! Prepare yourself for the battle of love. Experience Romance, Envy, Action, and Excitement! 54 Levels of Increasing Excitement! 54 Original Love Messages to Send!!! 6 Love-assassins to Face and Defeat!!!! With your trusty dove on your side, can you win this Game of Love? Here is the YouTube Video of My Love My Valentine Game. Paul McCartney’s My Valentine – a song of love, a work of art. No quest for love-songs can be complete without Paul McCartney’s My Valentine. It’s one of the most beautiful love songs that’ve ever been written and sung. If this music could cast an impression on me, someone who has absolutely no understanding of music, it could make the stoniest of hearts feel the joy of love. the sun was going to shine. I’d tell myself that I was waiting for a sign. without remembering the reasons why. the sun was gonna shine. Here’s a lovely video of Paul McCartney’s My Valentine featuring Natalie Portman and Johnny Depp. You must watch this. Why Voracio the Crow isn’t easy to dodge? What drives this agent of your rival in love? The constant cawing would take its toll, Voracio knew that, but he also knew that his voice was his single biggest asset and that without his cawing prowess he was doomed to live in oblivion. Things hadn’t been easy for Voracio for the last many months. It was in June last year that he had lost his place as the evening entertainer in the best bird-club in town, to a rooster. He knew it would happen one day, but he didn’t expect it to happen so soon. Voracio was a rapper and these days rock was the in-thing…especially among the birds. Hip-hop was something that didn’t suit Voracio’s voice at all, so his options were somewhat limited. Had Voracio been the carefree bachelor of the year before, this wouldn’t have irked him so much. At the beginning of last year, he had fallen for his beautiful crow and proposed. His decision of marriage had shocked Voracio almost as much as it had shocked his friends, but then until you’ve experienced the full force of love, you’d never understand it. Any way, the long and short of it all was that Voracio was facing difficulties in making both ends meet. This was especially painful because just recently Mrs. Voracio had given birth two two beautiful chicks, a boy and a girl, and Voracio was extremely worried about his ability to pay the remaining EMIs on his nest. If the nest went, it would devastate the family. 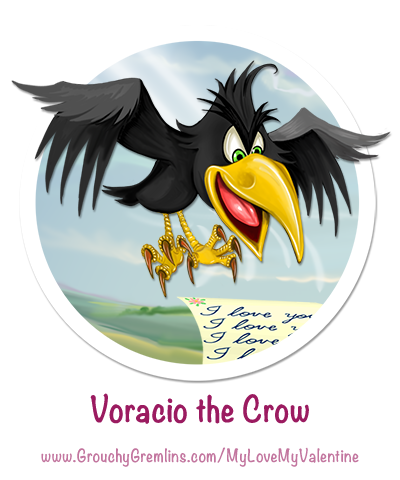 While Voracio was just a very normal kind of crow who didn’t have any special talents (except that he could rap,) he had a trait that very few in this world possess. He could persevere and persist. Perseverance is something that often spells the difference between success and failure; and Voracio knew this. So he went flying from bird-club to bird-club, hoping to land a job that will help him pay his bills. Nothing worked out, for a very long time, until just last week he landed a job. He had to rap twice a week, in one of seedier bird-clubs, usually frequented by the birds of prey. It was here at this club, where he first met Grouchy Gordon, an owl so ancient that he had stopped looking any older. Gordie was sitting at table in the shadows, on a branch that was jutting so out of the tree that no other bird ever sat on it. He asked Voracio to join him at his table, and then asked him if he wanted to do something different, something that was more thrilling than singing rap songs to a half-loony audience. While Voracio wasn’t very comfortable talking to this shady looking character, he decided that listening won’t harm him, and so he listened. “I’ve heard that you can be persistent. Have I heard right?” the Owl asked. Voracio thought of his incessant requests for an audition and his continued followups with the club, and nodded. He obviously couldn’t refuse. If only he could get five gold coins a week, he’d be living like a king! 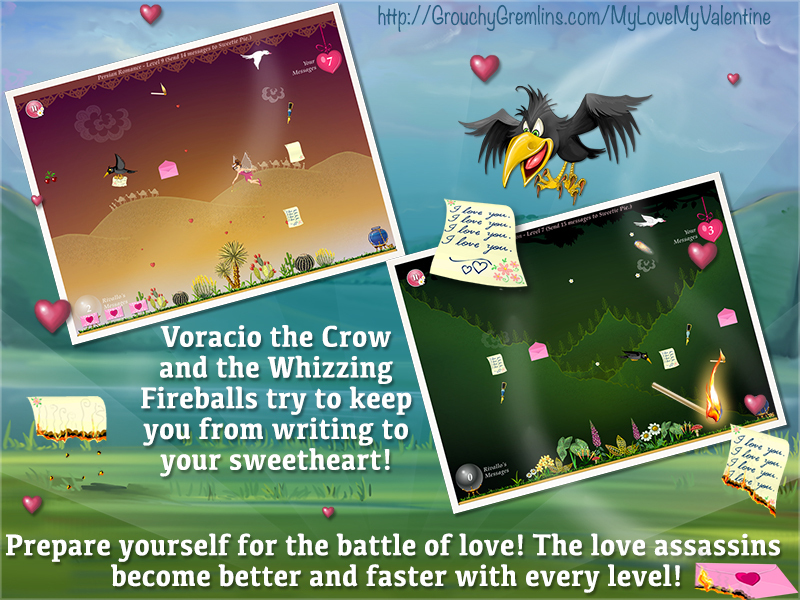 This is why you encounter Voracio the Crow in My Love My Valentine – The Game of Romantic Courtship. Experience his perseverance and persistence. My Love My Valentine – MLMV HD is reaching the App Store on February 1, 2013! I will update this page soon upon its release so bookmark and follow, if you want to experience love, romance, and rivalry in a completely new format. 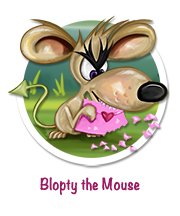 If you are looking for a tip to escape Voracio’s single-minded pursuit of your love-notes, you will find it here, but wait until you’ve cleared the first nine levels! And yes, if you want to gift hours of fun, 54 Levels of increasing thrill, a dash of envy, and 54 Love Messages to your sweetheart, think gifting My Love My Valentine to him or her. Did I tell you that it’s for girls and guys both?!! Enter your email address to receive My Love My Valentine news and miscellaneous love-bytes from a forever-lost-in-love artist. Read Stories of the Game Characters. Pencil Knight now on the App Store – Download Free and Go-tilting! 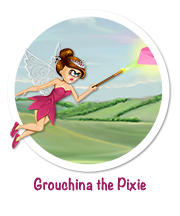 Pencil Knight – A Tilt-and-Play Game for iPhone, iPad, and iPod – Glued together with Gremlin Love! Unrequited Love may pave your way to Greatness – The Love-story of Pope Francis.